McBride has performed and recorded with a number of jazz musicians and ensembles, including Freddie Hubbard, McCoy Tyner, Brad Mehldau, Herbie Hancock, Pat Metheny, Joe Henderson, Diana Krall, Roy Haynes, Chick Corea, John McLaughlin, Wynton Marsalis, Pat Martino, Hank Jones, Lewis Nash, Joshua Redman, and Ray Brown's "Superbass" with John Clayton, as well as with pop, hip-hop, and soul musicians like Sting, Paul McCartney, Celine Dion, Isaac Hayes, The Roots, Queen Latifah, Kathleen Battle, Renee Fleming, Carly Simon, Bruce Hornsby, and James Brown. McBride was born in Philadelphia, Pennsylvania. His father, Lee Smith, and his great uncle, Howard Cooper, are well known Philadelphia bassists who served as McBride's early mentors. After starting on bass guitar, McBride switched to double bass and studied at the Juilliard School. McBride was heralded as a teen prodigy, having joined saxophonist Bobby Watson's group at the age of 17. From 17 to 22, McBride played in the bands of older musicians such as Watson, Freddie Hubbard, Benny Golson, Milt Jackson, J.J. Johnson and Hank Jones as well as his peers such as Roy Hargrove, Benny Green and Joshua Redman. 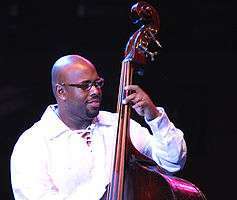 In 1996, jazz bassist Ray Brown formed a group called "SuperBass" built around McBride and fellow Brown protégé John Clayton. The group released two CDs: SuperBass: Live at Scullers (1997) and SuperBass 2: Live at the Blue Note (2001). McBride was a member of Joshua Redman's Quartet in the 1990s with pianist Brad Mehldau and drummer Brian Blade. In 1995 McBride began leading his own groups after his debut CD Gettin' To It (Verve Records) was released. Saxophonist Tim Warfield, pianists Charles Craig and Joey Calderazzo, and drummers Carl Allen and Greg Hutchinson are among the musicians who played in McBride's early groups. From 2000 to 2008, McBride fronted his own acoustic / electric, jazz, fusion and funk ensemble, "The Christian McBride Band" with saxophonist Ron Blake, pianist/keyboardist Geoffrey Keezer and drummer Terreon Gully. As writer Alan Leeds stated in 2003, it was "one of the most intoxicating, least predictable bands on the scene". The band released two CDs – Vertical Vision (Warner Brothers Records | 2003) and their Live at Tonic three-CD set was released in 2006. In 1996, McBride contributed to the AIDS benefit album Offbeat: A Red Hot Soundtrip produced by the Red Hot Organization. McBride primarily plays double bass, but is equally adept on the electric bass. He played bass for the collaborative project The Philadelphia Experiment, which included keyboardist Uri Caine and hip-hop drummer Ahmir "Questlove" Thompson. Other projects have included tours and recordings with the Pat Metheny Trio, the Bruce Hornsby Trio, and Queen Latifah. Like Paul Chambers, McBride can solo by playing his bass arco style. In 2006, McBride was named to the position of "Creative Chair for Jazz" with the Los Angeles Philharmonic, taking over from Dianne Reeves. He was initially signed to a two-year contract that was subsequently renewed for an additional two years. He was eventually succeeded by Herbie Hancock in 2010. 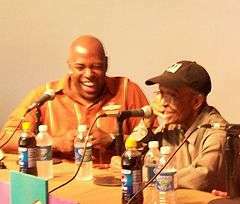 McBride performed with Sonny Rollins and Roy Haynes at Carnegie Hall on September 18, 2007, in commemoration of Rollins' 50th anniversary of his first performance there. McBride was also tapped by CBS to be a producer for the tribute to Rollins on the 2011 Kennedy Center Honors broadcast. In 2011 McBride released his first big band album, The Good Feeling, for which he won the Grammy for Best Large Jazz Ensemble Performance. McBride leads five groups: "Inside Straight", featuring alto/soprano saxophonist Steve Wilson, vibraphonist Warren Wolf, pianist Peter Martin and drummer Carl Allen; a trio featuring pianist Christian Sands and drummer Jerome Jennings; his 18-piece big band; an experimental group called "A Christian McBride Situation" with pianist/keyboardist Patrice Rushen, turntablists DJ Logic and Jahi Sundance, saxophonist Ron Blake and vocalist Alyson Williams; and the "New Jawn", featuring trumpeter Josh Evans, saxophonist Marcus Strickland and drummer Nasheet Waits. In March 2016, McBride was named artistic director of the Newport Jazz Festival, succeeding the festival's founder and artistic director, George Wein. Christian is married to jazz singer and educator Melissa Walker. Walker, with contributions by McBride, leads the Jazz House Kids, a jazz school in their home town of Montclair, New Jersey. Each summer, they both appear at the Montclair Jazz Festival, along with student ensembles led by the instructors, professional ensembles composed of instructors, and guest acts. McBride shared the story of his first encounters with Freddie Hubbard, "The Gig", and his relationship with James Brown "Mr. Soul On Top" on the Peabody Award-winning Moth Radio Hour, a radio show and podcast devoted to story-telling. 2002 Vertical Vision Warner Bros.
↑ Yanow, Scott. "Christian McBride: Biography". Allmusic. Retrieved 2011-01-02. ↑ "Christian McBride bio" (PDF). Los Angeles Philharmonic. Retrieved September 23, 2009. ↑ "Garnegie Hall official website". Carnegiehall.org. Retrieved 2011-07-17. ↑ The Moth, February 10, 2011.